Tamil Emperor Rajendra Chola I is known to be one of the greatest rulers of the Chola Empire. He is remembered for his statesmanship, governance and military prowess, especially of the building and operational deployment of the Chola Navy. The coronation of Emperor Rajendra Chola I took place in 1014, exactly a thousand years ago. To commemorate the millennium year of this great event, the National Maritime Foundation (NMF), Chennai Chapter, in association with the Indian Navy and the Government of Tamil Nadu are conducting a series of events. As part of this commemoration, a sailing expedition by the Indian Navy’s Sail Training Ship INS Sudarshini commenced from Chennai Port today, 04 November 2014. 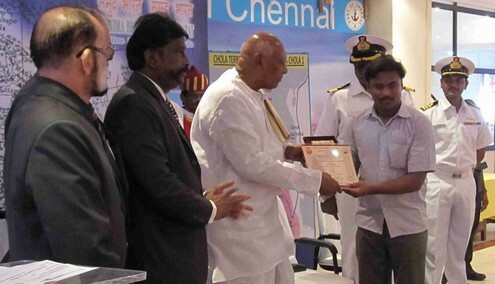 INS Sudarshini was flagged off by His Excellency Dr. K Rosaiah, Hon’ble Governor of Tamil Nadu at about 1130 hours. INS Sudarshini is expected to reach Nagapattinam (historically important port of Chola Empire) on 05 November 20014 with cadets of the Indian Navy, NCC, Marine Commandos on board to symbolise the achievements of the Chola Navy. Sudarshini was escorted out of Chennai Port by yachts of the Tamil Nadu Sailing Association and the Royal Madras Yacht Club. At Nagapattinam, INS Sudarshini will be received by the local elite. Prior to flagging off, winners of the Elocution Contest for college students (conducted earlier) on the Legacy of Emperor Rajendra Chola I in English and சோழ பேரரசின் கடல் ஆதிக்கமும் கடல் வணிகமும் in Tamil were also felicitated. 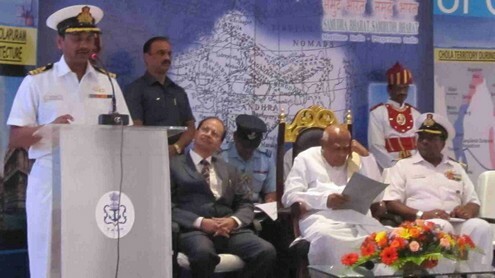 Welcome Address by Commodore Amar K Mahadevan, VSM, Naval Officer-in-Charge, Tamil Nadu and Puducherry. Address by Commander Rajashekhar, Commanding Officer INS Sudarshini. Address by Commodore (Retd) S Shekhar, IN, Regional Director, NMF about Emperor Rajendra Chola I and his Legacy. Address by Shri Chola Nachiyar Raja Sekar, President of Tamil Chamber of Commerce. Prize Distribution to Winners of Elocution Contest – சோழ பேரரசின் கடல் ஆதிக்கமும் கடல் வணிகமும் in Tamil. Address by His Excellency Dr K Rosaiah Hon’ble Governor of Tamil Nadu. Vote of Thanks by Commodore (Retd) S Shekhar, IN, Regional Director, NMF, Chennai Chapter. Flagging off by His Excellency Dr K Rosaiah Hon’ble Governor of Tamil Nadu. 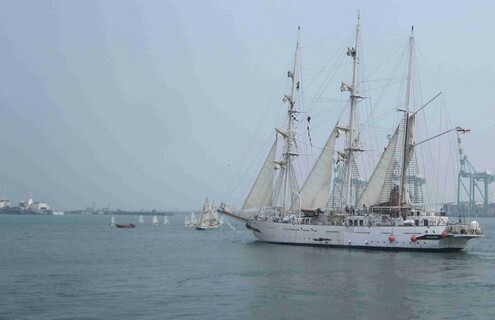 INS Sudarshini casting off in the company of yachts of the Tamil Nadu Sailing Association and the Royal Madras Yacht Club. Here is a small video clip of INS Sudarshini casting off. Thanks to NMF, Indian Navy and the Government of Tamil Nadu for the initiative taken to create public awareness of the rich maritime heritage of India, specially of Tamil Nadu. समुद्र भारत समृद्ध भारत – Samudra Bharat Samrddha Bharat (Maritime India – Prosperous India). Very interesting and informativ, with photos and video clip.